It may soon be the end of the line for Canada’s motor city. After churning out cars and trucks for General Motors Co. for more than a century, the town of Oshawa, Ontario could find itself without a plant as the Detroit-based automaker extends its shift into electric vehicles. Amid a heavy winter downpour, stunned GM workers walked off the job in protest Monday after learning the company has no plans to produce vehicles there after December 2019. The news will affect about 3,000 hourly and salaried workers, more than a third of GM’s workforce in Canada. In all, GM plans to cut 10,000 jobs in North America. Oshawa, located about 60 kilometers east of Toronto, currently builds the Chevrolet Impala and Cadillac XTS cars, both of which are being discontinued, and does finishing work on pickup trucks built in Fort Wayne, Indiana under a program that’s slated to end in late 2019. “It doesn’t mean we won’t continue to look for opportunities, we will, but there are no assurances of that at all,” David Paterson, GM Canada’s vice president for corporate and environmental affairs, said in a phone interview. GM said the closures, which will also affect four U.S. factories, are part of a broader shift towards electric and autonomous vehicles. “It’s obviously an extremely tough day for us but it is nevertheless important and exciting to be in a company that wants to lead in electric and autonomous and, like many industries that are transforming, if you don’t take bold steps you risk a much bigger dislocation,” Paterson said. 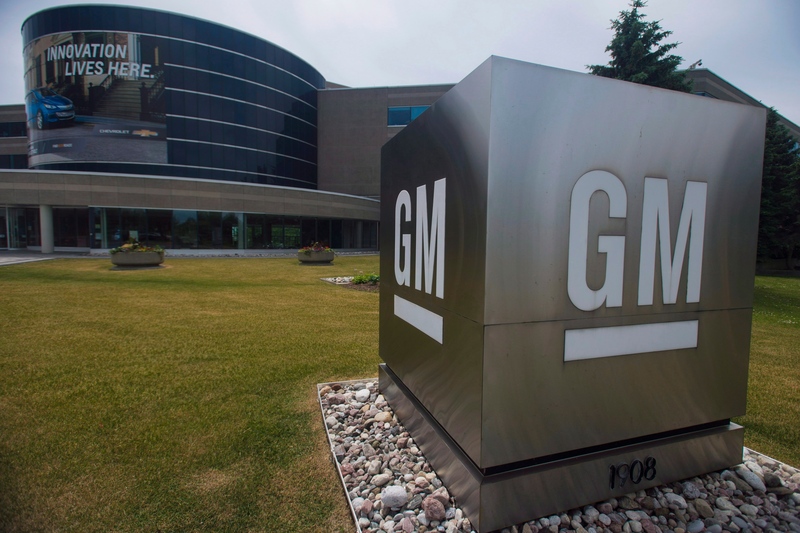 He stressed that GM will remain one of the biggest employers in Oshawa, with over 2,000 people working at the company’s Canadian headquarters and engineering center and an OnStar call center. Ontario Premier Doug Ford was less optimistic, saying GM told him there is not much the government can do. “The ship has already left the dock,” he said. The car history runs deep in Oshawa. Robert McLaughlin and his sons Sam and George started making McLaughlin cars there in 1908 before selling to GM in 1918. The Detroit carmmaker then opened its own plant in 1953, with production boosted by the 1965 auto pact that allowed cars to be shipped more easily to the U.S. market. In the 1980s the three plants produced as many as 730,000 cars and trucks a year, and employed about 23,000 people. The GM car plant has always been woven into the fabric of the town. The junior hockey team, where Bobby Orr once played, is called the Oshawa Generals, and they played at the GM arena until it was renamed in 2016. “GM workers have been part of the heart and soul of Oshawa for generations -- and we’ll do everything we can to help the families affected by this news get back on their feet,” Prime Minister Justin Trudeau said in a tweet. Bank of Canada Governor Stephen Poloz grew up in Oshawa and was well aware of the significance of the industry. The impact of the plant closure extends beyond GM workers and their families. As many as 10,000 jobs are tied to companies that supply parts for the plant, said Flavio Volpe, head of the Automotive Parts Manufacturers Association. Some 500,000 jobs are tied to the auto sector in Canada. “It’s not just General Motors, it’s all the parts suppliers, logistics companies, they’re all involved in putting these vehicles together and if we’re gone it’s a lot bigger than just GM,” said Jesse Forbes, who’s worked for GM in Oshawa for 17 years. The 2,600 hourly jobs that will be lost represent about 4 per cent of all non-parts auto manufacturing jobs in Canada. According to payrolls data from Statistics Canada, there were 43,300 Ontarians employed in motor vehicle manufacturing as of August 2018. 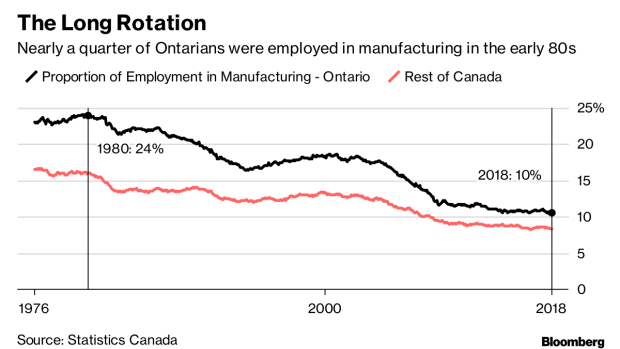 That represents just 0.7 per cent of all employment in the province, but 71 per cent of all Canadian car manufacturing jobs. While General Motors has dramatically reduced production and assembly in Canada, it announced a plan in June 2016 to hire about 700 engineers to expand research into self-driving cars and other technology. GM made the announcement with Trudeau and former Ontario Premier Kathleen Wynne who cited the investment as an example of the province’s ongoing shift into high-tech manufacturing and innovation. The new positions, which were to increase GM’s group of engineers from 300 over several years, included work in self-driving software and controls development, safety technology, infotainment and connected vehicle technology. Paterson said Monday that the company is still aiming to employ 1,000 engineers, up from 750 currently. That’s cold comfort for Darryl Donnithorne 38, who said he was laid off by GM when it closed its Oshawa truck plant in 2008, He just got hired back a couple of months ago to install windshields on the pickups sent from Indiana. --With assistance from Erik Hertzberg, Josh Wingrove and Greg Quinn.